1. Print the template on regular paper or cardstock and cut out all the pieces. 2. Make all folds along the dashed lines away from you. Use glue or double-sided tape to secure all A tabs to the back of their corresponding pieces. To close the basket shape, fold and secure the B tabs to the back of their corresponding pieces. Fold all C tabs inside the basket and secure them. 3. Secure one yellow end of the handle to the outside of the basket; secure the other end of the handle to the opposite side. 4. 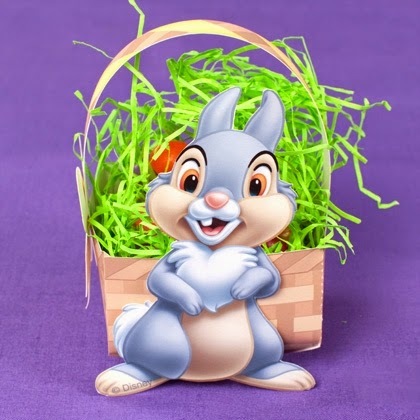 Use glue or double-sided tape to secure Thumper to the front of the basket – his feet should be flush with the bottom of the basket. 5. If you would like to use the paper grass instead of plastic Easter grass, cut out the strips and gently curl them to fit inside the basket. Your basket is now complete! Give it to someone special for Easter.